Theater should evoke a wide range of emotions. From joy, to pain and sadness, to some that can cause an audience to squirm in their seats — these feelings are what make great theater. This month, San Diego audiences have the chance to experience truly great theater at the Point Loma Playhouse, when James P. Darvas directs Samuel D. Hunter’s A Permanent Image. Called a “fusion between realism and the absurd,” A Permanent Image is a “tense exploration of the distance families put between themselves and what it takes to bring them back together,” according to the theater’s website. 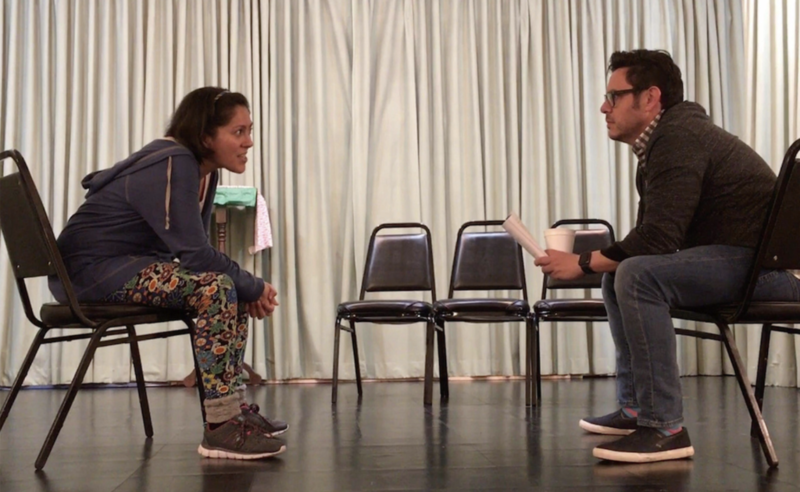 In fact, this play takes place on Christmas Eve, when siblings return Bo (Salomon Maya) and Ally (Sandra Ruiz) to their childhood home in Idaho for the funeral of their father (Daniel Jaquez). Their Mother Carol (Anna Sandor) has painted the whole house white. Through home videos played live on stage, the audience comes to find out more about the family, the father, and the tense relationship between individuals mourning loss together. While some might call a play about the death of a parent sad or heavy, A Permanent Image is delightfully witty and at times downright hilarious. Siblings Bo and Ally bicker back and forth, while their mother drinks again and again, signing Christmas carols to break up their arguing. Throughout the evening, the children learn more about their father and the life their parents had before and after they moved away. While death is certainly a central theme to the work, Darvas says it’s much more about what is left behind. While three actors are physically on stage, through the use of multimedia, a fourth actor — the father — is represented via “home movies” or scenes shot prior to the full production. It’s an element that presents a unique challenge, Darvas said. A Permanent Image will make you laugh, cry and undoubtedly spark numerous conversations during rides home from the theater. Bring a family member or two for this not to be missed show! A Permanent Image plays at the Point Loma Playhouse at the Point Loma Assembly Hall, 3035 Talbot St. in Point Loma February 15, 16, 17, 22, 23, 24 and Mar 1,2,3. Showtimes are Friday and Saturday at 8 p.m. and Sunday at 2:30p.m. Tickets are $15–$20. To learn more or to purchase tickets, (619) 800-5497 or email info@pointlomaplayhouse.com.